According to Forrester Research, "Enterprise data virtualization has become critical to every organization in overcoming growing data challenges," with faster access to connected data, self-service, and agility among the many benefits seen. In this report, Forrester analyzes past research and Forrester Wave reports, user need assessments, and vendor and expert interviews to evaluate the offerings of top vendors in enterprise data virtualization. In compiling the vendor rankings, the report reviews the current offering, strategy, and market presence for the 13 most significant vendors. 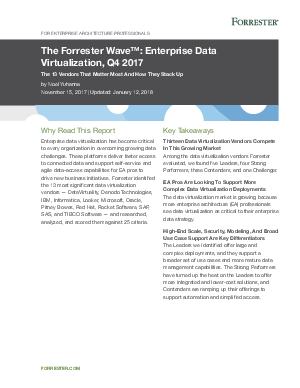 Read The Forrester Wave™: Enterprise Data Virtualization, Q4 2017 report to learn more.